Pruning is important for maintaining the health and beauty of many plants in the garden. However, pruning can be confusing for many gardeners. Here are some answers to common pruning questions. When should I prune my plants? Winter is a good time for pruning many, but not all, plants in your landscape. In the winter, plants are dormant, which means they aren’t actively growing. Pruning plants that are dormant can reduce stress to that plant. For deciduous trees, pruning them while they are leafless in the winter can make it much easier for gardeners to see the branch structure. Before you prune, be sure you know what plant you are pruning. Plants that flower early in the spring, such as dogwood and cherry trees, have already formed buds in the fall. If you prune them during the winter, you will cut off flower buds and lose those spring flowers. On the other hand, plants that bloom later in the season, such as crape myrtles, typically form flower buds on new growth in the spring. Winter is an ideal time to prune these plants. How to Prune Specific Plants, a guide to pruning 75 common landscape plants. Deciduous Tree Pruning Calendar, a guide from Virginia Cooperative Extension. Shrub Pruning Calendar, a guide from Virginia Cooperative Extension. Evergreen Tree Pruning Calendar, a guide from Virginia Cooperative Extension. A Quick Guide to Pruning Hydrangeas, from University of Maryland Extension. Keep in mind that gardens in Maryland are probably colder and in a different USDA Hardiness Zone than your NC garden. I know when to prune. How should I prune? Any time you are pruning, do not remove more than ⅓ (one-third) of the existing plant material. If you remove too much of the plant and foliage, the plant will have a difficult time recovering. When you are pruning, start by removing any branches that fall into the three D’s: dead, diseased, or damaged. Dead wood will be dry and dark in color on the inside when you cut it, whereas living plant tissue is lighter in color on the interior. When pruning any diseased plant, be sure to clean your tools before you continue to prune other plants. Clean the blades of your pruners with a 9:1 solution of water:bleach. Be sure the blades are dry before storing your tools to avoid rusting. When pruning, cut the branch back to just above a node (a point where leaves or other buds are present on the branch). If you are cutting back to the trunk, do not cut flush with the trunk. Instead, remove the branch just outside the swollen area where it emerges from the trunk. This is called the branch collar. Branches pruned to just above the branch collar will heal naturally. Larger branches should be removed using multiple cuts, to avoid stripping the bark from the tree trunk. With very large branches, it is advisable to call a professional for assistance. There are a few different types of pruning cuts. Heading cuts can be used to decrease plant size. This removes actively growing shoots, and can stimulate growth at the remaining nodes on the plant. Thinning cuts are used to control the shape of the plant. Thinning cuts are important for removing branches that may be growing in undesirable directions. Thinning the canopy of trees and shrubs allows light and air to enter, and can improve growth and reduce pest pressure. What tools do I need for pruning? How to Clean and Sharpen Your Pruners, from University of New Hampshire Extension. Be sure to watch the video! Correct pruning can greatly improve the growth and form of plants in your garden. As always, contact your local Extension office if you need further guidance. 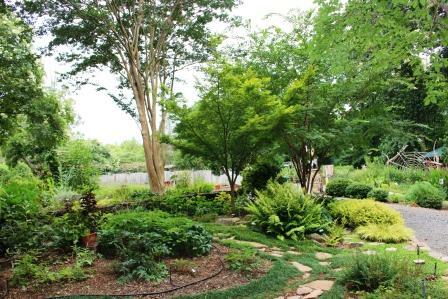 • How Do I Prune Crape Myrtle?